We have had a lovely weekend in relation to the weather. The sun has been shining and it has been a lovely temperature. I have been in the shed except for during Sunday lunch yesterday – which was Mothering Sunday. My neck and shoulders are getting to me and I am a day later than I planned. I have actually finished doing the colour matching except for one or two tweaks. The garden is beginning to look quite spring-like. Although we had some mild weather when the Magnolia started flowering, we had a cold blast which turned it off white. It is still going strong, but there are a lot of tepals lying on the ground now. The Camellia have been flowering, but the cold blast sent the white ones brown and the red ones brown-tinged. The tulips are fantastic and you already know that we have plenty of Daffodils and a few Jonquil. The Malus Evereste has now got tight flower buds on it. Can you imagine that the season is starting all over again? I showed you the flower of the Malus Red Sentinel last time. Now I will show you the apples. 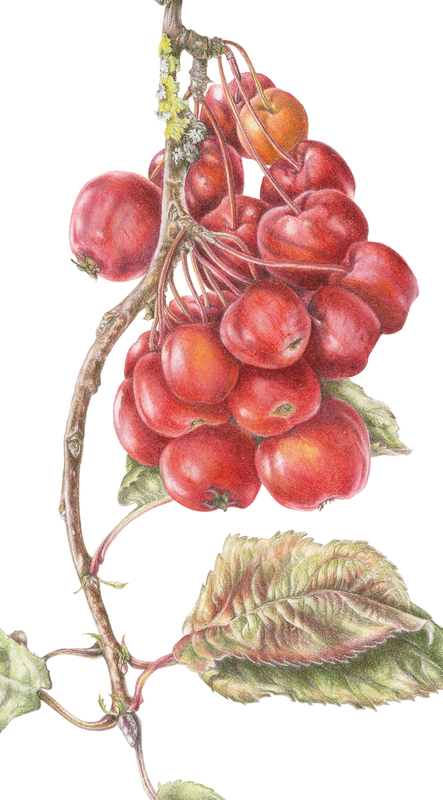 As with all the crab apple pictures, this too is in coloured pencil.